Remember Google Wave? Yes, quite a handy collaboration tool that mostly failed due to a silly invitations-only policy stretched over way too longer than it should. Well, apparently, even after Google gave up the idea and most of its code as Open Source, there are still people who work on making it succeed. Save Google Wave is the website that keeps track of several alternatives and provides a simple functional overview of each. 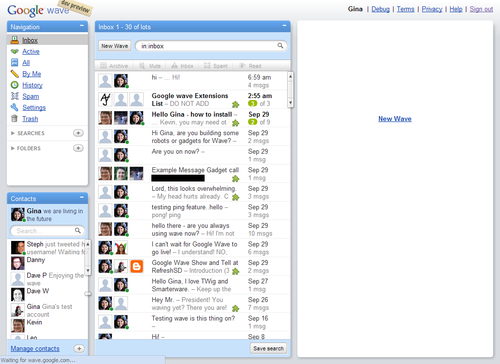 Google Wave – a new real-time collaboration tool from Google has entered the developer preview stage. About 100,000 selected people got invited to see and use the system. Some of those people are already posting early reviews and screenshot tours. Here is one such review in Lifehacker blog. I personally haven’t tried the thing yet. But from all the reviews, screenshots, and videos of Google Wave that I’ve seen, I think that I will either totally love it or really hate it. There are some really cool things in it, like integration of email, chat, and rich-text which is almost as rich as an application. But on the other hand, some of the integrated tools are those that I depend upon on a daily basis, and which I am very sensitive to changes at. Until now, from those other people, I can’t figure out if that integration and all those improvements are something that will fit my personal use pattern. P.S. : does anyone else think that the default view looks very much like MS Outlook? Weird. I know that smart people tend to think the same and that naming collisions happen once in a while, but is this just a mere coincidence or is there more to the story? Google Wave is “a personal communication and collaboration tool” announced by Google at the Google I/O conference, on 27 May 2009. It is a web based service and computing platform designed to merge e-mail, instant messaging, wiki, and social networking. It has a strong collaborative and real-time focus supported by robust spelling/grammar checking, automated translation between 40 languages, and numerous other extensions. It is expected to be released later in 2009. Displaying a desktop notification is as easy as sending an email. Adobe® Wave™ is an Adobe AIR application and Adobe hosted service that work together to enable desktop notifications. It helps publishers stay connected to your customers and lets users avoid the email clutter of dozens of newsletters and social network update messages. Adobe Wave is a single web service call that lets publishers reach users directly on their desktop: there’s no need to make them download a custom application or build it yourself. Of course, once you get into it things get more obvious, but can you really tell the difference between the two without reading more about each technology and watching preview videos?